The engineering problems solved by American Geotechnical Inc. often start off subtly – a door doesn’t shut tight or a window separates from its frame. However small, these are sometimes signs of serious structural issues below a house or building. And the California-based geotechnical engineering and material testing firm frequently relies on Surfer software to visualize what is happening with the structure and determine the cause. American Geotechnical refers to this part of its practice as ‘forensic engineering.’ The structural problems it investigates in residential and commercial buildings often result from ground movement below or around the foundation. In areas where the structure is built on a structural cement slab, excessive moisture or other soil conditions may cause the slab itself to tilt, dome or warp. If unresolved, these situations can lead to major failures of the structure above. “We use Surfer to map the stresses around the structure…to help the engineers figure out why one part is sinking, and another is swelling,” said Manuel Simbulan, Technical Illustrator/CAD Designer at American Geotechnical. The typical first step is for geotechnical engineers to capture relative elevation measurements, called deflections, across the slab using a simple water level. Even for a standard-size home, the technician may collect 100 or more measurements. The goal is to determine a baseline elevation for the slab and then convert the other values to plus or minus numbers depending on whether they are above or below the average. Simbulan imports the elevation values into Surfer and generates several 3D maps of the surface – 3D wire diagram, colorized contour, and a gradient visualization. This may show a simple tilt in the slab, a doming at the center, or a complex surface with more ups and downs than a roller coaster. The result gives a general idea of where the stresses are coming from. Swelling clays may be lifting part of the slab, or eroding soil may be causing another side to sink. “Moisture in the soil could be the problem,” said Simbulan, explaining that poor drainage may cause rainwater to pool up around the foundation or a water pipe could be leaking. Soil moisture is usually detected by digging small pits around the outside of the structural slab. The soil is analyzed for water content. 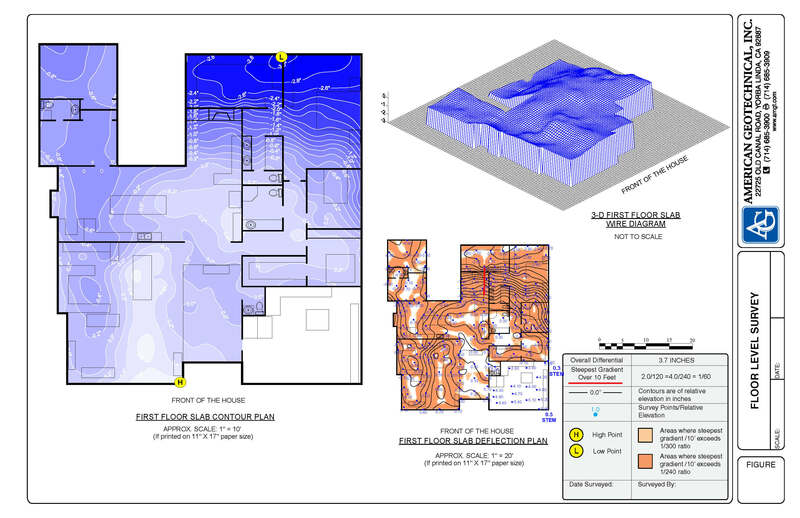 This data can also be visualized in Surfer with the deflection contours overlaid, providing correlations between soil moisture and slab deformation. Simbulan delivers these Surfer maps to the geotechnical engineers for final analysis. Once the source of the structural problems has been pinpointed, the engineers recommend a solution, which can range from mitigation of the soil moisture to adding subsurface supports to the slab. In some cases, the building must be demolished if the problem is bad enough. American Geotechnical owns several mapping and visualization software packages, but Simbulan prefers Surfer for the forensic engineering applications because of professional look of the color contours it renders. “These are the maps we present to clients and use in court during legal testimony,” said Simbulan.